← This week’s RRR info! Hi runners – tonight (Wednesday) as usual Speed Training takes place at 8pm. Meet at Sedona Entrance on To Ngoc Van street. Saturday afternoon we’ll meet at 3.55pm at JAFA restaurant, G2-G3 Towers, Ciputra for our usual social run with distances to cater for all levels and abilities. See you there! Earlybird online registration for Song Hong 2012 finishes tomorrow (15th). After that, it will be the same price to sign-up online or in person at Elite Fitness, 51 Xuan Dieu. Free t-shirts for half and 10km entrants will only be supplied while stocks last, so to avoid disappointment please register soon. Stay up to date with all the latest info about Song Hong 2012 on our dedicated web page. 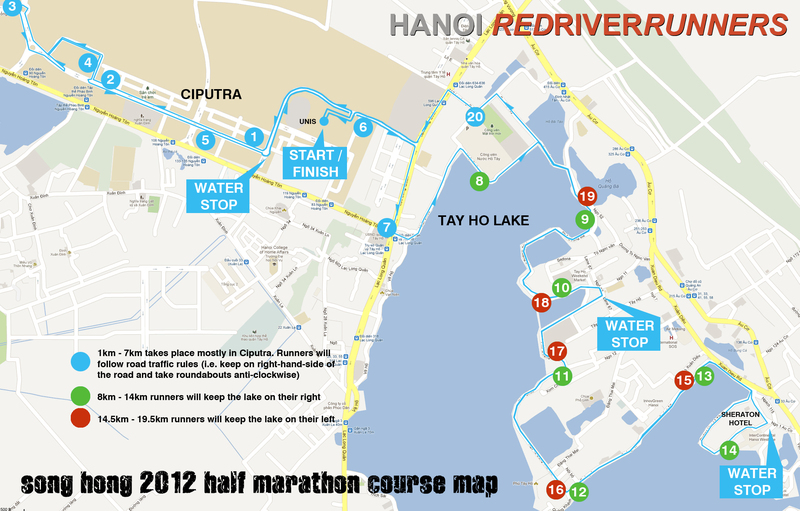 Half marathon and 10km routes have now been posted!